READY TO HEAD SOUTH for more study options? New Zealand and Australia offer a great backdrop to world-class tertiary education in native English-speaking environments. Between the two countries they hold three of the top-ten places in the Times Higher Education rankings for international staff. Sweet as, mate. New Zealand — Land of the Long White Cloud — had been made famous by the Lord of the Rings trilogy, but before that it was known for pioneering people: first to allow women to vote, first person to split the atom, first to climb Mt Everest. Universities continue the pioneering spirit in this beautiful country. New Zealand’s biggest city sits on an isthmus between two beautiful harbours and boasts surf-beaches and native forest within an hour’s drive of the CBD. Once you arrive the moniker “City of Sails” becomes instantly clear making it a great location for waterbabies. Auckland has a plentitude of institutions and specialist centres catering for all tastes: the two best known are the University of Auckland and the Auckland University of Technology. The University of Auckland is New Zealand’s top University and was ranked 50th in the world by The Times Higher Education World University Rankings in 2007. It hosts the largest University library in the country and the largest research commercialisation centre in Australasia. Not a bad place to study really. AUT (Auckland University of Technology) is also located in the city centre and known for it’s creative IT and journalism courses amongst a multitude of industry-focussed qualifications. The Kiwi capital is small and groovy; the set of Peter Jackson’s cult film Braindead and the home of the Beehive – New Zealand’s parliament building. Expect a solid local arts scene and cafe culture alongside a small but friendly University and the national museum, Te Papa. Victoria University makes the most of this and relationships with several other local research centres to provide research-based degree and post-graduate courses. A job with local company Weta workshops would certainly be an education in itself, but there’s less chance of that than Frodo making a cameo in Halo 3! Parocial Christchurch sits on the east coast of the South Island. A beautiful city centre is bordered by beautiful Akaroa on one side and climbers and snow fans will love the slopes of Aoraki-Mt Cook being less than an hour away. It is also the proud home of the Canterbury Crusaders, New Zealand’s top rugby team. Canterbury University is one of the two top South Island Universities, boasting several research centres and an energetic student community. Unlike most Kiwi cities, Christchurch is remarkably flat making it very comfortable for wheelchair users and cyclists. Prefer a different approach? Grab your glasses and head to one of the Southern hemisphere’s premier wine regions to study wine and viticulture at Nelson Marlborough Institute of Technology. 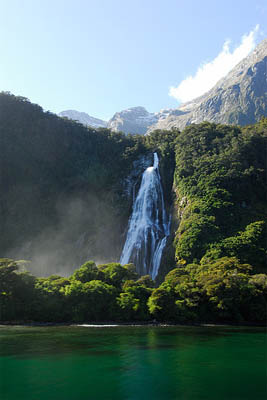 You’ll be in the region of the iconic Cloudy Bay amongst many others. Courses are available at certificate, diploma and degree levels with access to their excellent Wine Research Centre. NZ Wine has a fuller list of study options from casual wine appreciation courses to serious drinking programmes. As home of the Zorb and pioneers of bungy jumping, New Zealand seems the perfect place to study Adventure Tourism. On the practical side, Adventure Training New Zealand offers 18 week courses aimed at international students looking to explore the South Island while gaining the technical and personal skills necessary for life as an adventure sports guide. They also offer assistance finding a job in the industry at the end of the course — sweet as. Australia has a lot more to offer international students than Crocodile Dundee. Australia has a lot more to offer international students than Crocodile Dundee. The land of kangaroos and crocodiles has a wealth of study options in metropolitan cities stretching along the coast from Perth in the west to the rich eastern states. Australian National University, the country’s top University is based in the capital Canberra, but I certainly wouldn’t recommend it over the country’s other main cities. Sitting alone on the west coast, Perth is a paradise for those seeking a relaxed and productive lifestyle within easy reach of the sea and top wineries. It’s known as Aussie’s “Education City” and many European students I’ve spoken to prefer Perth to centres in Sydney or Brisbane. There are five Universities to choose from including the prestigious Curtin University of Technology which is ranked in second and sixth place world-wide for International staff and students respectively. It’s MBA programme is especially lauded, recently being placed fourth in the world by the EIU. And when all the stats are too much, head down to the beach for a surf. Melbourne has to be my favourite Australian city: along the Yarra River run excellent local arts and cultural events, great museums and galleries, not to mention the Australian Centre for the Moving Image and the MCG – famed for cricket and Aussie rules football all wrapped up in a modern design ethic emerging from Victorian roots. It’s replete with Universities: no fewer than nine of them! The creative energy is amazing. Both the Univerity of Melbourne and Monash University are top 50 Universities with great campuses in the centre of this funky city. Australia’s biggest and flashiest city is stereotypically represented by its Opera house and harbour bridge. But behind that is the strongest economic drive in the South Pacific which brings in lots of business opportunities and big shows. Sydney is a big festival city with the Madi Gras and the largest Chinese New Year celebrations outside of Asia. The University of Sydney is the top ranked University amongst four others so — once again — there’s plenty of choice in this exciting city. Brisbane is the largest city on Australia’s east coast and has a reputation for fun, sun and surf. Forgetting the beautiful Gold Coast and Sunshine Coast, Queensland also has a reputation for quality education. The Queensland University of Technology offers a wide range of Undergraduate degrees, giving ample choice for those looking to study in a place in the sun whilst the University of Queensland has a well-recognised research ethos. A speciality for Australia? It’s far too big to simplify, but with the Great Barrier Reef sitting off the coast budding Marine Biologists and Oceanographers can have a field day in Australia. One new specialist course to consider is the Bachelor of Coastal Studies at the University of the Sunshine Coast. Located just north of Brisbane it’s the perfect place for beach-lovers. Northern hemisphere visitors should note that the Australasian University calendar is somewhat different, starting semester one in February or March and semester two in July or August; some institutes run intensive “summer schools” in January and February. If you’re looking to research further you can check visa and entry information for New Zealand and Australia and visit University directories for New Zealand and Australia.